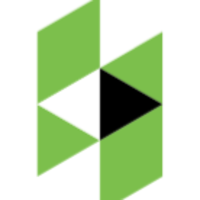 If you’ve only recently moved into your first home, this holiday season might seem a little more hectic than usual. On top of buying furniture, settling in and creating a sense of home in your new space, you may feel obligated to deck it out with decorations and maybe even host a family gathering or two. Although it sounds impossible, it can be done while preserving you and your family’s sanity. Here are five easy, low-maintenance holiday decorations to get started with this month. Try an alternative to the traditional tree. If you still have a pile of boxes stacked in your living room, the last thing you need is a fresh cut Christmas tree shedding its needles all month long. Forgo the tradition this year and invest in an artificial tree that you can use for other chaotic years down the road. If even that sounds like too much, fill glass jars with fallen branches or create your own tree on a wall with decorative Washi tape, as seen here. It comes in a variety of colors and leaves your walls mess-free after the season passes. 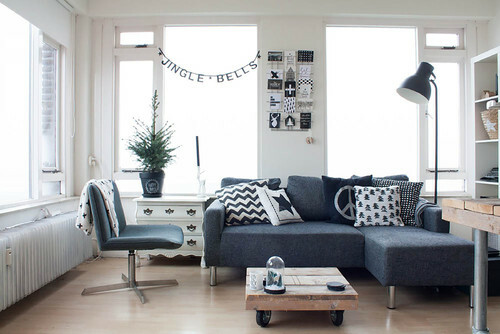 Say yes to string lights everywhere. Christmas lights have a lot of use value beyond adorning pine trees every December. 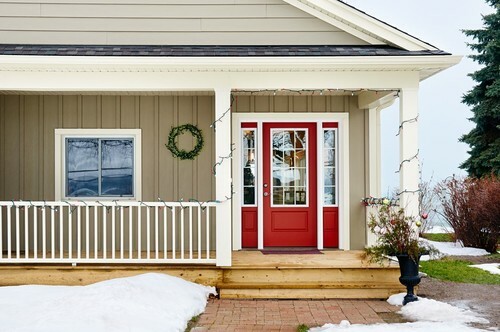 The bundle of green lights seen outside this Toronto home gives a unique spin on the traditional holiday wreath and the loose lights draped over the front porch help spread holiday cheer without going overboard. Bring fairy lights indoors and lay them flat along the fireplace mantel, dining table or headboard for a dreamy winter wonderland vibe. Keep the centerpiece simple. If your table runners and centerpieces are lost somewhere in the mess of moving boxes, don’t fret. Decorate the table with a few foraged finds from your backyard or neighborhood. 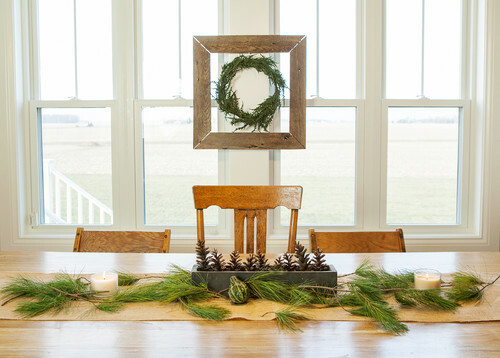 Scatter fresh green branches across the length of your table and set a couple of pinecones or leftover Thanksgiving gourds in the middle for an effortlessly charming look. Switch up the color scheme. If you’re feeling oversaturated by the traditional red and green colors showcased everywhere this month, refresh your palette indoors with a different color combination. Take inspiration from this Scandinavian apartment and keep things simple with a monochromatic palette. Decorate with a few festive snowflakes or printed pillow covers and hang up a classic letter garland that spells out your favorite holiday saying. Create a fire feature. The warm glow of candlelight and stacks of rustic firewood are classic icons of the chilly winter season and look great when paired together. 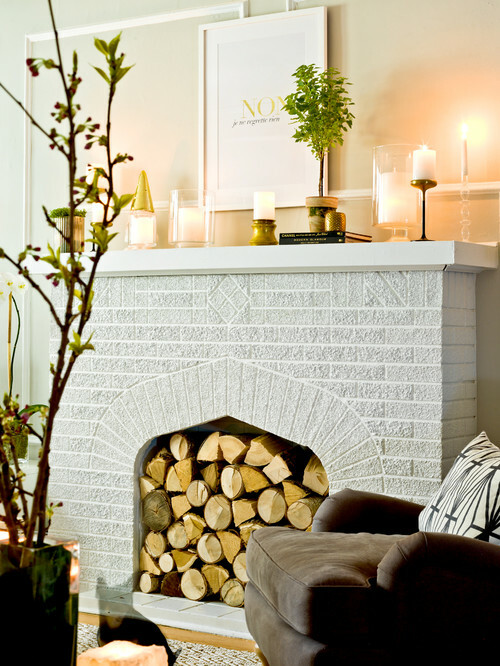 Regardless of whether you have a fireplace, you can pile wood logs in your hearth or stack them in an empty corner of a room. Add to the cozy ambiance with scented candles that infuse your home with the smell of gingerbread snaps and peppermint bark, or opt for realistic-looking flameless LEDs if you have little ones at home.